Epact: Crucifix Dial unsigned, late 16th century ? 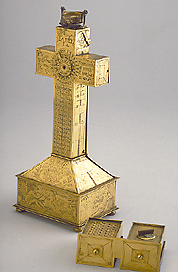 It was not unusual for crucifix dials to be used as reliquaries, combining the useful purpose with the sacred. This instrument probably had a more profane design: one whole side can be lifted, to reveal another brass plate, a pair of drawers (probably an ink pot and a pounce pot) and another empty compartment.